Luxury award winning bed and breakfast accommodation. 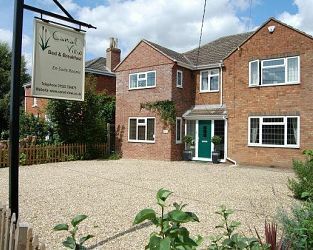 Located in the picturesque village of Saxilby close to the historic City of Lincoln. All rooms are ensuite. Free WiFi, free parking and close to a train station. Visit Lincoln Lincolnshire and the surrounding villages and stay in b and b, hotel or vacation rental accommodation provided by BedPosts members. The Norman bishop Remigius built his church on rising ground to be “as strong as the place was strong and as fair as the place was fair”. It developed after fire and earthquake into the present triple-towered Lincoln Cathedral. The Early English work of Bishop Hugh Of Avalon in the aisled choir, apse and transept was continued by his successors, resulting in one of the most magnificent of the English cathedrals. Lincoln's copy of Magna Carta is preserved in the chantry Of Bishop Longland. Stephen Langton, the Archbishop of Canterbury who played a leading part in the struggle with King John, was born in the county. Among many remarkable sights, the city has a castle founded by William the Conqueror, two well-preserved Norman domestic buildings (the ]ew's House and another misleadingly known as “The House of Aaron the Jew”), a gateway that has been in use since Roman times, the High Bridge with medieval houses built over the arch, and a river frontage at Brayford Pool. If you seek accommodation near Lincoln in Lincolnshire you have come to the website of a “club” of providers who offer affordable quality accommodation around UK in hotels, bed and breakfasts, guesthouses, inns, and restaurants plus self-catering cottages and apartments .